(2012 Life with Preservers Contest) Crest doesn�t do anything. Far Springs at night. A hazy dance of ribbonous steam lit silver by starlight. Whispery music of leaves and life. A naked elf basking in hot water. Crest simply lounged there, his senses slightly dulled by a near-perfect formula of comfort and intoxication. Not fretting on a new recipe for drink. Not tapping out a tune on his drum. Not splashing with a furmate or his wolf-friend. Not even recuperating from a wound suffered on a hunt or expedition. In this supremely languid moment he was reaching the limits of his own formidable tolerance for dreamberries. Fortunately he didn�t need to put any effort into getting more from his travel sack. His favorite Preserver was always happy to oblige. �More yummy berrydreams for Brewberry Highthing?� Berryflop chimed, fresh leaf-full of violet bounty in its arms. Crest smiled a mellow smile at his friend. His fellow connoisseur took up residence on a flat stone, where it happily munched away at the biggest, juiciest looking one of the lot. Crest slowly reached over and plucked up another handful. With the free hand, he picked one up and looked it over, not looking for anything in particular, then slowly positioned it between his thumb and forefinger. It sailed forth in an arc not unlike that of his mohawk when it stood dry and full. The gem touched his tongue and melted into him. All at once, sound and scent and taste left him as the sights before him intensified. The stones surrounding the spring glowed blazing grey and dazzling brown. The leaves further off became vibrant blasts of green and yellow. The moons became as daystars. Their collective forms became writhing, liquid things, and the excess of color and light they'd spontaneously generated seeped outward and upward, like steam from the water. All while this was going on the stars in the sky unfurled themselves, and evaporated. Crest marveled at the sight. Gurgleflap was in front of his face then, trailing wisps of brilliant pink and purple and red. Its wings were boiling off, and their beating sent the membranes blowing away all the faster. The elf leaned in for a better look, to see blue cap and gold-orange eyes atomize and scatter in puffs of pigment, followed by a white trail that might have been its teeth. 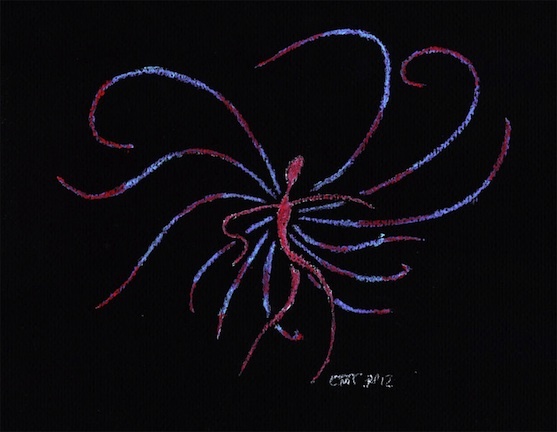 Toes and fingers sublimated as its aqueous body continued to distend and distort, leaving behind a reedy figure backed by wriggling tendrils of electric light. The stick-thing propelled away, and tinny laughter far away as the moons sounded in Crest's ears. The hallucination began to ebb as soon as the elf became aware he was having one, and his senses ebbed back. The rocks withdrew into themselves, yellow-green mist condensed into leaves, the stars blossomed back to life in the sky. And Berryflop was itself again, setting down with more berries in tow, looking up at him quizzically. Crest simply shrugged. It had been an unexpected, though not unwelcome, experience.